Simple and easy to use, with external two-step instructions and clear cover wall mounted for recognition and accessibility, always available on display, easily portable with convenient handle, simple "On-Off" control lever, constant reading supply gauge, 90 minute supply, resuscitation LIFE® CPR mask with one-way valve, fits both adult and child, REFILLABLE low cost by any compressed gas distributor with universal CGA #870 fitting, tight seal protects unit from dust and moisture, units come ready to use—full of oxygen with wall brackets and screws. 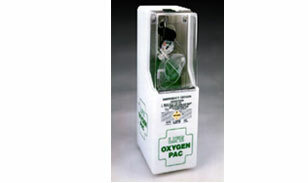 LIFE® OxygenPac features a LIFE® CPR mask for "mouth-to-mask" resuscitation with a one-way valve. This eliminates direct contact with the victim's mouth and nose while resuscitating a non-breathing person. Maximum hygiene is provided by the one-way valve, which eliminates transmittal of fluids and contagious diseases. LIFE® CPR mask invertably fits both adult and child. (Patented). Price includes all shipping costs. This is the lowest internet pricing available. Call or email for a lower quote if ordering more than one!